AE911Truth Editor’s Note: The following is an excerpt of a letter written by Honorary Italian Supreme Court President Ferdinando Imposimato for the Journal of 9/11 Studies. While AE911Truth does not speculate on who was involved in the destruction of the WTC skyscrapers, we applaud Imposimato for speaking out on this important issue, calling attention to the explosive 9/11 evidence, and, most importantly, pursuing justice. 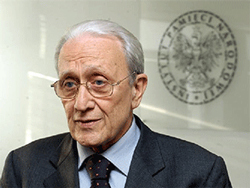 Ferdinando Imposimato has extensive experience investigating high crimes as a former state prosecutor The reports of the National Institute of Standards and Technology (NIST), November 20, 2005, set forth the following conclusions: The airplanes that struck each of the Twin Towers caused a breach as well as an explosion evidenced by a giant fireball. The remaining jet fuel flowed onto the lower floors, sustaining the fires. The heat from the fires deformed the building structures and both towers collapsed completely from top to bottom. Very little that was of any size remained after these events except steel as well as aluminum fragments and the pulverized dust from the concrete floors. Recognizing that such grave crimes threaten the peace, security and the well being of the world. Affirming that the most serious crimes of concern to the international community as a whole must not go unpunished and that their effective prosecution must be ensured by taking measures at the national level and by enhancing international cooperation. Next articleHo, Ho, Ho! 9/11 Was An Inside Job!